On September 20, 1940, one of the most famous European art dealers disembarked in New York, one of hundreds of Jewish refugees fleeing Vichy France. Leaving behind his beloved Paris gallery, Paul Rosenberg had managed to save his family, but his paintings--modern masterpieces by the likes of Cézanne, Monet, and Sisley--were not so fortunate. As he fled, dozens of works were seized by Nazi forces, and the art dealer's own legacy was eradicated. More than half a century later, Anne Sinclair uncovered a box filled with letters. "Curious in spite of myself," she writes, "I plunged into these archives, in search of the story of my family. To find out who my mother's father really was." 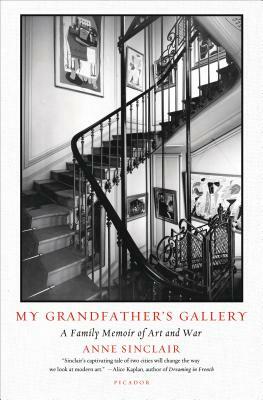 Drawing on Rosenberg's intimate correspondence with Picasso, Matisse, Braque, and others, My Grandfather's Gallery takes us through the life of a legendary member of the Parisian art scene. Rosenberg's story is emblematic of millions of Jews, rich and poor, whose lives were indelibly altered by World War II, and Sinclair's journey to reclaim it paints a picture that reframes the history of twentieth-century art. Anne Sinclair is Paul Rosenberg’s granddaughter and France’s best-known journalist. For thirteen years she was the host of 7 sur 7, a weekly news and politics television series that had some of the highest ratings in France. While there she interviewed all the major global figures of the day, including Bill Clinton, Mikhail Gorbachev, and Madonna. The director of French Huffington Post, Sinclair has written two bestselling books on politics. Until 2012 she was married to Dominique Strauss-Khan. Shaun Whiteside is a Northern Irish translator of French, Dutch, German, and Italian literature. He has translated many novels, including Manituana and Altai by Wu Ming, The Weekend by Bernhard Schlink, and Magdalene the Sinner by Lilian Faschinger, which won him the Schlegel-Tieck Prize for German Translation in 1997.